welcome to the site! Read the description to the left for details regarding the theory behind this site. Some may know this section as an "Abstract"
Under this section is a paper written for an Honours Psychology course, the History of Psychology. The task was to trace a topic from contemperary Psychology back through various historical stages to see how that topic has grown over the course of time. The topic I chose was energy, or Energy Psychology. Enjoy research from Feinstein (most recent) all the way back to Pythagoras. the end is the beginning. This section includes all the previous homepage fails ;) enjoy! This is the major veiwpoint taken on this site in regard to these topics, but since the completion of my Masters degree in Gender Studies, I've been trying to go back and make it more inclusive. This link includes a proposed field theory for Psychology because the two major branches of Psychology (quantitative and qualitative) find it hard to see eye to eye. This (and the next) section is for members only. This section proposes a Grand Unified Field theory or "theory of everything" for Physics, backed up by a mathematical equation. This section unites all sections together to unite the branches of Science and Religion. Many different perspectives are taken and these two seemingly opposing forces are united through many different angles. This section looks at the conflicts or cycles between New Age free thought and Orthodox dogmaticism. The feud between these two opposing forces revealed the truth regarding the story of Jesus, what he really taught and to whom he truly gave the rites to teach his faith. This section explores why the movie The Last Temptation of Christ was banned in other countries, looks at the Da Vinci Code and presents a controversial paper/theory showing the hidden meaning of world religious symbols. This section includes research done on the importance of emotional charge on ESP communication. It proposes that it is emotion communication that makes telepathy successful. The second paper in this section addresses dreams and dream interpretation. Two Dream interpretation methods (Freud's and Jung's) were analyzed to determine which method produced the most accurate results. The third paper presents research on Understanding Altered States of Conciousness and the last paper in this section is about Western Consciousness and how we are very individualized and perhaps out of balance due to us being lost in the Grand Illusion (Maya). The next paper looks at The Implication of Eastern Concepts on Western Ideals, to propose a potential balance between the two world views. This section begins with a work that is a detailed analysis of the screenplay/poem found in the Art section of this site. This paper looks at the research behind the play that inspired its manifestation (or why I wrote the play). It is hard to avoid the Book of Revelations when the topic of the Apocalypse comes up, so the next paper in this section is a comparison of the similarities and differences of the Book of Daniel and the Book of Revelations. Many similarities were found and the research leads one to beleive that we are in the dawning of the Age when we will see great changes in the world as we know it today. This section includes papers on 3 pathways to happiness (physical, mental, emotional), followed by a paper on how to end prejudice, a paper on the polarization of the sexes is next (as it is hypothesized by this site that the true or pure unification of All That is in the Universe is solved by the reunification of the energy of the sexes ;). Finally, this section ends with an empirical thesis exploring the equal validation or rational and emotional styles. This section contains a play or screenplay called the Grand Drama that is written entirely out of prose (the owner and creator of this website has personally written everything that appears on it). This work of art reveals a hidden message, one that may unlock the key to the mysteries of the universe! This page also includes a shortened poem of the Grand Drama and provides a link to a song that is about Plato's Analogy of the Cave (members only). this is a collection of my poetry - enjoy! the parts under construction are labeled as such or blanketed by <<< ____ >>> indicating personal notes to self to improve the site, or the layout of the information presented. Previous Ganzfeld experiments have found significant evidence of an ESP effect, yet methodological flaws such as improper randomization and sensory leakage have been found in previous experiments. Another concern has been the varying effect sizes found from one experiment to the next. These issues have been addressed in this paper. A Ganzfeld experiment was conducted to determine if emotion was a significant influencing factor in the ESP phenomenon, as it was hypothesized that emotion created the catalyst of sender-receiver success. The results did not reach significance due to insufficient power. The hypothesis of whether emotion creates the element necessary for success remains undetermined but, upon analysis seems to suggest that if the experiment was continued, it may have led in the right direction. Limitations and confounds within the experiment were discussed and a theory for how the ESP phenomenon may occur was included. The re-evaluation of the reliability of the tools used to test said phenomenon was also discussed. Extra-sensory perception (ESP) has been tested empirically by Ganzfeld experiments, which have shown significant, repeatable evidence of an ESP effect in the laboratory (Storm & Ertel, 2001; Palmer, 2003; Bem & Honorton, 1994; Wooffitt & Allistone, 2005). ESP has been operationally defined as an anomalous communication or energy transfer exchanged between a sender and receiver without using any known communicative mechanism (Bem & Honorton, 1994). The effect size of these experiments has been quite robust and researchers have repeatedly reported a probability of one in three, when chance states that the findings should be one in four (Bem & Honorton, 1994; Milton & Wiseman, 2001; Storm & Ertel, 2001; Wooffitt & Allistone, 2005). Wooffitt and Allistone (2005), assert that if these findings were in any other field or domain, there would be no controversy or question that something significant has been found through these experiments. Although the idea of ESP is not well received, there has been a growing renewed interest in the field (Wooffitt & Allistone, 2005). This research will reopen the Ganzfeld study to attempt to recreate the effect of previous Ganzfeld experiments using moderators that have been found to enhance ESP performance. This research will also attempt to introduce a possible theory that could help explain the ESP phenomenon. In a typical Ganzfeld paradigm, a receiver participant meditates in a room with a T.V screen and a dim red light. After the meditation, they stare at a TV screen that displays static and emits a white noise sound. In another room, a sender participant watches one of four static images or movie targets on their screen. Every thought or image the receiver experiences during the sending period is written down on paper which is referred to as a mentation sheet. At the end of the session the receiver is asked to select which one of the four pictures or movie targets they believed the sender was watching. After aggregation of data through meta-analysis, Ganzfeld experiments have produced more significant results that have been considered evidence of paranormal phenomena, or a genuine ESP effect (Palmer, 2003; Bem & Honorton, 1994). Considering the effect size remains consistently quite robust, Bem and Honorton (1994) have stated that the effect size and replication rates of the Ganzfeld experiments are adequate enough to bring these data to the attention of the broader psychological society. The idea however, that Ganzfeld experiments have produced significant results is not the issue of this proposal. Many researchers have agreed that the debate is not over the findings as being significant (Storm & Ertel, 2001), but over issues concerning methodological flaws and procedural designs (Hyman, 1994; Bem & Honorton, 1994; Bem, 1994; Milton & Wiseman, 2001; Storm & Ertel, 2001; Wooffitt & Allistone, 2005). Methodological flaws in Ganzfeld experiments have included improper randomization of target stimulus and sensory leakage (Bem & Honorton, 1994). Another issue in the ESP debate has been over the varying effect sizes produced from one experiment to the next (Storm & Ertel, 2001; Bem & Honorton, 1994). Methodological flaws have been fully discussed between critics and supporters alike to create a more ridged, controlled procedure (as described by Joint Communiqué), which is highly accepted as improved scientific protocol for Ganzfeld methodology (Bem & Honorton, 1994; Storm & Ertel, 2001; Wiseman, Smith & Kornbrot, 1996). The Joint Communiqué was compiled in 1985 and published in 1986 by Hyman (critic) and Honorton (supporter) (as cited in Storm & Ertel, 2001) and has addressed concerns regarding improper randomization of target stimuli and sensory leakage. According to Joint Communiqué procedure, the images selected to be target stimuli should appear in the experiment an equal number of times. This experiment was designed with 32 pairs of participants in mind and each target stimulus was to be shown an equal number of times. Only 29 trials were successful, therefore concerns regarding this issue have been addressed in the discussion section. Another randomization concern was taken into consideration for this study. When the experiment was completed, the receiver was shown four static images representing the four target stimuli. To avoid selection bias, each receiver was shown the pictures in a different sequence. Also, due to the target stimuli being limited to four in number, the results of the experiment could be compared to the accepted portion of the Ganzfeld database. Sensory leakage has been a threat to previous experiments because, if the nature of the target stimulus is revealed in any way, it threatens the validity of the data and of the experiment itself (Bem & Honorton, 1994). The proposed experiment was conducted to minimize sensory leakage as much as possible. However, given the lack of resources for the experiment conducted, both the sender and the receiver were in the same room separated by a divider. A researcher was present during the experiment to monitor for sensory leakage. Concerns regarding this issue have been addressed in the discussion section. The other major issue concerning Ganzfeld experiments has been the debate over the varying of effects sizes from one experiment to the next. To address the concern regarding varying effect sizes, the proposed experimental design has taken into consideration all procedures that have shown to increase success rates in the past. In other words, all the moderating variables that have contributed to higher effect sizes in previous experiments have been included in the design of the experiment. Thus, the design has made the experiment as sensitive as possible. Moderators that have been found to increase effect size have included a meditative technique, a warm inviting atmosphere, belief in ESP phenomena, personality trait correlates with Ganzfeld success, acquainted sender-receiver pairings, moving versus static targets, and negative versus positive affect. Mediation and atmosphere. The meditative technique before the experiment and a warm ambient atmosphere during, have been shown to moderate or have increased the effect size of Ganzfeld experiments (Bem & Honorton, 1994; Wooffitt & Allistone, 2005). Ganzfeld experiments that do not allow for a warm inviting atmosphere and/or relaxation method have shown to produce less significant, to non-significant results (Storm & Ertel, 2001). High scores on hit rates were found to correlate with participants who have had prior experience with meditative techniques, even if they had no previous experience with Ganzfeld procedures (Bem & Honorton, 1994). High hit rates, or Ganzfeld success rates refer to the number of correct selections made by the receiver in regards to the four target stimuli. Along with room comfort and pleasant atmosphere, the use of a red light has been found to be another positive influence on Ganzfeld success. It has been said that the red light in the room has resulted in richer ESP experiences than other colours of light (Tsuji, Hayashibe, Hara, & Kato, 2004). Sender-receiver pairings. It has been found that participants who brought their friends to sessions did significantly better than those who were paired up with strangers (Bem & Honorton, 1994). The hit rate of those who brought their friends was .44 compared to a hit rate of .26 between strangers (Hyman, 1994). This experiment had allowed the participants to participate with a friend, or to be randomly assigned with strangers. The analysis however, was conducted by another colleague and is consequently not discussed in this paper. Dynamic vs. static targets. Bem & Honorton (1994) have stated that Ganzfeld experiments run with static pictures produced hit rates of 27%, and experiments that used moving targets produced hit rates of 37%, which is significantly higher than the result found with still pictures (Fisher’s exact p < .04). Even experiments run with a “View Master stereoscopic slide reel” containing target stimuli were more successful than experiments run with still pictures (Bem & Honorton, 1994; Bem, 1994). This experiment presented moving target stimuli or video clips to the sender, rather than static images in attempt to increase effect size. Personality trait correlates with ganzfeld success. Creativity has been found to influence success, for example Bem and Honorton (1994) ran a sample from Julliard, a school for the creatively gifted through the Ganzfeld procedure; Seventy-five percent of the sample who were musicians chose the correct target and consequently showed the highest success rate on any Ganzfeld task ever conducted. Eight different studies have found that creativity is a characteristic common in participants that believe in paranormal phenomena, and has appeared to be related to success in a Ganzfeld experiment (Thabourne, 2005). Belief, like creativity has been an important correlate with Ganzfeld success because belief in ESP has also been found to increase success rates (Stanford, 2003). Creativity and music could be argued to be an emotional type of communication. Music and the arts are often utilized, when conventional words cannot get the point across. Consequently, those high in the personality trait of Intuition/Feeling (NF) on the Minnesota Multiphasic Personal Inventory (MMPI) have also shown high hit rates in Ganzfeld experiments (Alexander, 2000). Therefore, creativity and music and the emotion behind them may be other moderating variables in the effect size of Ganzfeld experiments. The idea that creativity and music could influence ESP success was incorporated into the design of this experiment by using music to evoke or intensify the emotional experience in the sender to see if emotion is a major factor in Ganzfeld success. The musical piece, Peter and the Wolf by Prokofiev has been found by Schmidt and Trainor (2001) to evoke an intense-negative emotion in listeners. This musical piece was selected to evoke extra emotion in the experimental condition in this experiment. The words had been removed to avoid distraction from the target stimulus. Negative vs. positive or neutral stimuli. In experiments conducted in dream clairvoyance research, it has been found that there were more correct hits with targets that were emotionally negative, than with targets that were neutral or evoked a positive emotion (Sherwood, Dalton, Steinkamp & Watt, 2000). Watt (1996) has also shown a connection or correlation with ESP and events that have evoked a negative or unpleasant emotion. Watt (1996) goes on to say that an overwhelming amount of ESP experiences have been reported in association with either serious injury or death. This was another reason why Peter and the Wolf was selected to be the musical piece used to intensify the emotional experience of the sender. Emotion has been found to be intensified in Ganzfeld experiment because an increase in arousal in the receiver was discovered during the sending period in response to the “sender’s perception” of the movie clips (Stevens, 2004). These findings, including the role of music, creativity and high NF scores have had an important influence on the major hypothesis of this paper and have sparked an interest in the role of emotion in ESP communication. In this experiment, the emotive aspect was isolated to determine if emotion is a major contributor in ESP success rates. Instead of the targets themselves evoking a negative emotion, they will remain neutral to better isolate the experimental or emotion condition. Furthermore, if negative or tragic events are behind ESP success, then it could potentially explain why ESP and perhaps other paranormal activity have been hard to measure or test empirically in an artificial setting like a laboratory. Perhaps the intensity of emotion experienced by the sender adds significantly to Ganzfeld success. Since music, creativity and emotion have been involved with most of the previously mentioned moderators, emotion may be a major contributor to ESP experiences. The field of parapsychology has been in need of theory-based research (Parker, 2003) therefore a potential theory of how ESP may occur will be proposed. The theory is that since ESP is correlated with creativity, musical ability and NF, it could be argued that ESP could also be a form of emotion communication, even a kind of emotional intelligence. If emotion has an influence on ESP performance, then ESP may be a phenomenon or product of emotional-based communication. Therefore, does emotion produce a significant increase in the effect size of the Ganzfeld experiments? Is emotion a major factor contributing to ESP success? Could the intense-negative affect needed for ESP success be a possible reason why ESP and other paranormal phenomena have been hard to recreate or test in a laboratory setting? A convenience sample consisting of mostly Brock University students were run though a recreation of a Ganzfeld experiment. Twenty-nine pairs of participants whose ages ranged from 18 to 45, with a mean age of 20 agreed to participate in the experiment. The sample consisted of 16 men and 42 women. The participants chose to participate with a friend, or were randomly placed together as they signed up for the experiment on Brock’s psychology research pool web site. All previously mentioned moderators that have been found to increase the effect size in Ganzfeld experiments were incorporated into the design of this experiment. These included the red lights, meditation, the option to participate with a friend, dynamic targets and the evocation of an intense negative emotion (using music). Each participant filled out a 15-minute questionnaire before the experiment took place. The participants were then randomly assigned to be senders or receivers by a coin flip. Those chosen to be receivers went with one of the researchers to the back of the room to meditate for five minutes to a guided meditation tape under a soft red light. The sender followed another researcher out into the hall where they drew a paper from a hat. The paper revealed to the participant what target video clip they would watch (represented by four numbers that corresponded to the four target video clips, one of which was circled), and whether they would listen to music (experimental condition), or not (control). There were 32 slips of paper in the hat, each video was represented an equal amount of times as were each condition and was sampling without replacement. The target videos were clips that included a fire in a fireplace, traffic, fish, or bees milling about in their hive. Neither researcher knew what number was circled, or what condition the participant was in during the trial. If the paper drawn read “no music”, they would watch the video clip that corresponded to the number circled. If it read “music”, the participant would watch the corresponding video, and listen to Peter and the Wolf through headphones. When the receiver was done meditating, they were lead to a chair in front of a TV which displayed only static. The white noise from the static could be heard very softly by the receiver only. The receiver was then asked to record on a piece of paper (the mentation sheet), any thoughts, images or emotions experienced during the sending period. The sender then entered the room, sat in front of a laptop and followed the instructions delegated by the paper. Each sender was instructed to concentrate on the image and try to send that image to the receiver at the back of the room using only their mind. Both sender and receiver were asked to be silent throughout the sending period, which lasted 15 minutes. Dividers separated the participants and the receiver could not see the sender as he or she entered or exited the room. The sender, in turn could not see the receiver at all during the sending period. A researcher remained in the room to monitor for sensory leakage. If sensory leakage was detected, the session would be omitted from the data analysis. When the sending period was over, the sender exited out of the video and was allowed to leave. The receiver was asked in an interview format which one of four images they believed the sender was watching (and they were asked to refer to their mentations). The choice was recorded. The receiver was then asked how confident he or she was with their answer and also, if it was their first “gut instinct”. If it was not first gut response, the instinctual choice was also recorded. A chi square test of independence was conducted to determine if there was a significant difference in amount of hits between the experimental and control conditions. The result of the test was non-significant X2 (1, n = 29) = .12, p = .730. However, although the results were non-significant, the effect was in the expected direction (see Figure 1). There were fewer experiments run in the music or experimental condition, due to the fact that there were three less trials than expected. Thus, there were fewer trials in the experimental condition, yet there were an equal number of hits in each group. But, as stated before, this effect did not reach significance. A chi square goodness of fit analysis was also conducted to determine if there was a significant selection bias to some targets over others. The result of the test was significant X2(df = 3, n = 29) = 10.86, p = .012. Traffic and fish were chosen significantly more than expected and bees and fire were chosen significantly less than expected (see Tables 1 & 2). A limitation or concern regarding the experiment was that some of the targets selected for stimuli may not have been as neutral as expected. There was a severe selection bias towards fish and traffic, as opposed to bees and fire (see Table1). Very few participants chose bees or fire as their answer. (It must be noted, however that due to the three less trials than expected, the video of bees was shown two less times than expected and fire was shown one time less than expected. Yet even if each target stimulus was presented an equal number of times or if bees were selected two more times and fire once more, from eyeing up the data, the observed selection bias would probably still be present). The selection bias may have been present because the participants may have had an aversion to these images and may have unconsciously created negative meaning to these stimuli instead of the neutral meaning intended. As a result, participants may have unconsciously avoided bees and fire as a choice when it came time to select the target stimulus. Perhaps if all the targets had equally positive or equally negative face value, this effect may have been avoided. Therefore, it is important for researchers in this area to take this into consideration when conducting future research. Since this experiment failed to repeat the findings of previous Ganzfeld experiments, there may have been methodological flaws. Some possible flaws in the experiment include a confound that may have been created by allowing a stranger to be present in the room at the time of the experiment. It has been shown by White (1976) that having a stranger present in the room has produced a negative, adverse effect on ESP scores. Limitations of the experiment include that fact that the sending period was not as long as other Ganzfeld experiments’ (15 minutes as opposed to 30 minutes). Also, both the sender and receiver were not in separate rooms due to lack of resources. Since no sensory leakage was detected using conventional means of communication this may not have caused a problem. But, if anomalous communication exists, the influence of the researchers conducting the experiment may have affected the data. The researchers were aware of the four target choices, and may have therefore unconsciously influenced the receivers. For example, one participant drew pictures resembling of all four potential target stimuli on the mentation sheet (case # 24). Therefore, in future research it may be necessary for the researchers to be blind to not only which target was being watched, but also to the nature of the targets themselves. Analysis did not support the hypothesis that emotion is a major contributor to the ESP experience, yet the results were in the expected direction. Thus emotion as a contributor to ESP success should not be ruled out entirely. Perhaps with better methodology to evoke an intense-negative emotion in ESP senders, significant results could be found through future replication of this experiment. Unfortunately it would be unethical to simulate negative circumstances or to intentionally conjure up tragic events that have happened to participants in the past. This could be why it has been hard to test ESP and other paranormal phenomena in an artificial setting. It may be suggested for future research that a beeper study be done to get more representative data. Perhaps, if a situation occurs naturally involving an ESP experience; the participant could document it and notify the researcher prior to the event. There are problems with self report, but perhaps both the sender and the receiver in the experience could reflect on it and questionnaire measures could be used along side self report measures for better validity. Overall, it may be beneficial for future research to investigate the role of emotion in ESP and Ganzfeld experiments. The ESP phenomenon could be a type of emotional communication or a form of emotional intelligence. It could be argued that the human experience of ESP could be related to the type of communication found in other animals, expressed by the more primitive brain structures such as the limbic system. When humans interact with other types of animals such as a dog or cat, it picks up on the tone of voice, urgency, and emotion behind the call or command, not necessarily the word itself. When tragic events occur to humans, there is no time for conventional thought processes to be carried out in a short amount of time. In these circumstances, we may be emitting an emotional signature or frequency that could be picked up by others if intensified to an optimal level. This may suggest that the ESP is a product of our more primitive limbic system (or emotional centre) that may be functional in this type of anomalous communication. Sciences and Engineering, 60(7-B), 3610. Bem, D. J. (1994). Response to Hyman. Psychological Bulletin, 115, 25-27.
process of information transfer. Psychological Bulletin, 115, 4-18. Hyman, R. (1994). Anomoly or artifact? Comments on Bem and Honorton. Milton, J., & Wiseman, R. (2001). Does psi exist? Reply to Storm and Ertel (2001). procedures and target emotionality. Dreaming, 10, 4.
conceptual development and replicability. Journal of Parapsychology, 67, 17-51.
dyadic esp. Journal of Parapsychology, 68 (1), 65-91.
meta-analysis of ganzfeld research. Psychological Bulletin, 127, 424-433.
paranormal. European Journal of Parapsychology, 20 (1), 79-84.
of Psychology, 63 (3), 217-223. Frequency of Targets Selected by Receivers. Observed Versus Expected Frequencies of Target Selections Made by Receivers. Freud and Jung represent two popular, but diverse theories of dreaming and dream interpretation. This paper highlighted the different techniques of interpretation and discusses their effectiveness. Two different dreams were interpreted and analyzed using the methods proposed by Freud and Jung respectively. Similarities and differences between the two methods and their utility to dream interpretation were then discussed. Freud viewed dreams as interpretable, but only through what he called Free Association, that at the same time was said to show how the dream itself was formed. According to Freud, the dream’s manifest content is nonsensical, child-like imagery conjured up by what our brain already knows. The latent content or hidden meaning of the dream is what contains the meaning. Freud used this latent content or meaning to help treat his clients of neuroses. Why the dream is formed is dependent on events that have already happened (day residues), childhood experiences or traumas, or from latent wishes of the dreamer. Free association was his technique used for interpreting the dream and revealing its hidden meaning. Dream formation has four mechanisms: Condensation, which is the fusing of feelings, thoughts and symbols into one unique image; Displacement, to help diffuse emotional affect to keep the dream meaning disguised; Visual Representation, which is the primitive, child-like imagery that illustrates the latent content; and Secondary Revision which attempts to make sense of a bizarre dream as not to awake the curious dreamer. If Freud’s theory of dreams and method of interpretation is apt, then applying his technique of dream interpretation will reveal important meaning and be utilized to solve problems in my waking life. The first dream from the author’s dream diary under the heading September 8th 2006 was selected for this study. Freud’s method of dream interpretation, Free Association was applied to the dream to evaluate its utility. The free associations were written down and included at the back of this paper in Figure 1. The dream was broken up into four parts and the headings “moving into the woods”, “the animals”, “the community” and “the fire” were written across the top of the page. While in a relaxed state, the first ideas that came to mind were recorded under their appropriate headings. The thoughts, feelings or associations were not always related to the content of the dream because the images in the dream were said to be there only to spark ideas and are otherwise irrelevant. The major theme of each category was summated at the bottom of the page and the overall theme of the four categories was then determined. We were camping, but it was more like we were moving to the woods because four guys (one my boyfriend, and the other three friends), were carrying my bed though the forest. I was lying on top of it and branches were brushing past me as it moved. They set the bed down in the middle of the forest and asked if it was good spot. When they put the bed down with me on it, a branch was poking into my stomach so I said it was good except the branch was poking me. One of the guys bent the branch out of the way. The woods then turned into a jungle and wild animals began to come out of the trees. There was a jaguar, tiger, a lion and a (something else I think a leopard). They came up to me and circled around me like they were my friends. I pet them and they all purred. I remember being very nervous, thinking they could eat me if they wanted to, but they didn’t. They actually guarded me as I slept that night. As I crawled into bed that night, it was almost like the forest had grown into a bedroom around where I lay. The lion slept on my left on the floor beside me guarding the door and ready to pounce, the jaguar was sitting upright behind the door at my feet, the tiger on my right and the leopard encircled the outside of the “room”. In the morning they left and went back out into the jungle (which was now a forest again). I remember thinking that that was really cool. I got up and noticed there was a community out there in the woods. There were cottages built there but no hydro. It was a party. We were all out there trying to save money by living in the woods and going out to various day jobs back in town, but celebrating it. That night there was a big bond fire and we all gathered around, talked, drank, sang and had fun. The free associations of the “moving into the woods” portion of the dream summated to a “getting back to nature” theme. The animals took my thoughts to someplace completely different and ended up at “societal worries”. The community portion summated to joys or hobbies that society provides, and the fire topic brought me to hobbies or social life that was more nature bound and primal (see Figure 1). The overall message of the dream according to Freud’s method of interpretation was dualistic. Half of the elements were about nature and the other half were about society. There was more to do with nature and pleasures than seriousness of society. Therefore, the interpretation of the dream according to Freud’s method could represent an imbalance between seriousness and pleasure or as Freud would say “love and work”. The dream could have been about day residues because events that happened in the recent past were present in the dream. I was at an outdoor music festival the weekend before that had bands and a big bond fire. The mattress we brought to sleep on was huge and more comfortable than my own bed. We camped at a place called Frontier Town and there was a saloon, and little cottages with signs on them that said blacksmith, bank, brothel etc. Frontier Town is owned by the Hell’s Angels and a couple fights broke out. The free associations did not bring me back to any childhood memories or traumas. But the idea of having fun and living a simple life harks back to a more innocent child-like way of life. The free associations may have revealed a wish. I do wish to be independent from society and live a simple, back to nature type life. I would also like to have fun all the time. I am intimidated by society and wish that it would respect nature and allow for more time to have fun and entertain hobbies. I tend to revere the social, fun and joyful aspects that western civilization has killed or wounded with its cold logic and greedy work ethic. So, the free associations did reveal that I wish to be having fun and partying rather than assimilating or conforming to society. Some examples of condensation were inherent in the manifest dream. For example, the forest or woods was at the same time a jungle, and where I slept was at the same time my last bedroom in Niagara-on-the-Lake (which no longer exists) and a part of the jungle made of trees. Displacement was apparent when the big cats came into the dream. I was very nervous about their presence, but they were friendly and purring which displaced the affect so it was not intense. The big cats may have represented the other party goers at the music festival, which potentially included members of the Hell’s Angels who may have made me a little nervous. The image of them was smoothed out because they appeared as members of the cat family. I have loved cats ever since I was a little girl and there is nothing more soothing to me than the sound of purring. So, the big, dangerous cats may have been a symbolic representation of the members of the Hell’s Angels at Frontier Town. The forest growing into the bedroom could have been the visual representation of the tent and camping out in the woods. When the tent cover or rain tarp that came with the tent was removed it was all mesh and we could see everything around us, including the trees. The forest bedroom seemed to represent this feeling. There were no verbal representations translated into symbolism. When the big cats came up to me I felt like I would in waking life, very nervous and cautious. In waking I know that running is futile because they run faster and can climb trees. So, in the dream I just froze, kept my cool and observed. When they came up to me for pets and began purring, I got the feeling like, “Oh, ok, they are my friends”. This could be interpreted as an attempt of making sense of a bizarre situation. It did make me relax a little when they were friendly and therefore did not wake me up. Jung viewed dreams as very interpretable and as representing an alternate way of thinking. Other than verbalizations, thought can also be symbolic or imagistic. The symbolism represents age old similarities that were said to be common in all cultures. Jung termed them Archetypes. Unlike Freud, Jung believed that symbolic thought was superior or more advanced than verbal thought because multiple meanings could be derived from one image. If Jung’s theory of dreams and method of interpretation is apt, then applying his technique of dream interpretation will reveal important meaning and be utilized to solve problems in my waking life. The second dream from the author’s dream diary under the heading September 8th 2006 was selected for this study. Dream two was put through Jung’s method of dream interpretation, Amplification to evaluate its utility. Two Amplification techniques were used: the “what is an x?” method and the “myth or fairytale” comparison. Objects or settings were defined so that an “alien” could understand. The layman definition was then compared to any issues that may have been present in the life of the dreamer (in this case the author). Only one aspect of the dream was selected to be defined or amplified due to the length of the paper: (1) carnival. The dream was then compared to any myths or fairytale stories to see if the moral or lesson of the dream could be attained using this method. There were no suitable myths for the dream, but the Bible story of Jacob’s ladder came to mind. However, the fairytale of Jack and the Beanstalk was applied. There was a carnival in town and we were all getting ready to go. I was living in some sort of apartment building (that I have never seen or been to in waking life) and was talking to an upstairs neighbour. Quintin, (my son – age 6) was with my mom and we talked on the phone to arrange a time and place to meet at the carnival. Mom said that Quintin wanted to bring his bed because it was getting late. When we all got to the carnival, we saw an “inflatable bouncer” (I think it was the one that inflates into a slide). We lined up so that Quintin could go on, but as I saw him climbing it I had an overwhelming urge to climb it too. I made a break for the bouncer and began to climb it so I could partake in the fun. I say “made a break for it” because as soon as I jumped onto the bouncer all the adults began to frown and come after me. One adult (a guy) jumped up and grabbed on to my legs. The bouncer then turned into a ladder. I seemed to then gather strength within myself to continue climbing. I kept climbing in spite of the guy hanging off my legs, pulling him up the ladder with me as I went. I looked down to see I had climbed very far and very high. The guy gave up and let go of my legs. He started to climb back down. Another adult, who was the attendant of the bouncer, was looking up at me as I looked down. Angrily, he climbed up after me, but because the other guy was still climbing down, he began to climb up the other side, or underside of the ladder. This made me gasp and I resumed climbing. The attendant was climbing a lot faster and caught up to me just as I was about to reach the top. As I reached the top and pulled myself up, the attendant also hit the top but because he was on the wrong side of the ladder his head hit the platform and fell off. I looked down because I was pretty high up and a fall like that could seriously injure or kill him. I couldn’t see. I stood up and saw that beside me on my right was another huge “level” or world of bouncers. The dream ended as I made my way over. What is a carnival? A carnival is a place of amusement, with rides and games (and food). It is usually where people go to have fun or celebrate to get away from work or school. Some carnivals are for adults or for a particular sporting event, but the one in the dream was for children. A fourth definition given in the dictionary represented it as a celebration before lent or a “putting away of meat” (gage Canadian Dictionary). These definitions do seem to be prevalent in my life because I like to have fun and get away from work and school. My persona is very childlike and I still enjoy the simple pleasures in life. I do celebrate life and am also a vegetarian. This definition reminds me of issues in my life because it revealed a theme of me not wanting to grow up because I wanted to play where the kids play. I do not want to “grow up” because society’s definition of growing up means you can no longer have fun, go out, have more than one friend, and/or pursue any personal interests or hobbies. This is why I went on the bouncer and all the adults were angry saying “you can’t do that!” It seems that people in my life keep telling me to grow up and be responsible. But I don’t understand what the one has to do with the other. Does growing up lead to responsibility? Does evidence support the idea that those who are not mature are not responsible? I believe that one can be responsible and keep the child-like pleasures. When I asked what society’s definition of growing up is it seems to revolve around the acquisition of money and total blind conformity to materialism. But what happens if one does not want the acquisition of money nor think it is all that important? My beliefs are not about placing money on a pedestal and worshipping it. I believe in the “come as a child” or “the bird that doesn’t worry about where it will get its next meal” or “go with the flow” type of mentality. Society’s definition of growing up to me is nothing more than selling yourself out to the almighty dollar and becoming corrupt with greed and not to mention placing the things that bring joy on the back burner. There is no balance of love and work in society; it is all about work, work and work. Therefore, I tend to keep my personal interests and hobbies and keep enjoying the simple pleasures at the same time maintaining a family and a household. Perhaps because society is more the work side, I maintain an overall balance by being more of the pleasure or love side. Therefore, the dream showed me if I wish to remain youthful, other adults will be upset. I did however; achieve my goal by making it to the top of the ladder. The theme of children and idea of climbing of the ladder made me think of the fairytale Jack and the Beanstalk. The idea behind Jack and the Beanstalk is that Jack sells the family fortune for something they regard as useless (letting his family down in the process), but it turns out that he makes up for the loss and then some because he found a treasure far greater. Jack was young and innocent and allowed himself to be gullible. Well, everyone gets taken advantage of in some point in their lives, but he used the situation to his advantage and tried to rectify it without dwelling on his mistake, thus learning from the situation in the process. This idea actually does apply to my live because I have talents that my family (and society) considers useless, but I refuse to fall prey to something I do not believe in and continue to reach for the clouds. I sold the family fortune by rebelling against society and its ideals and replaced it with music and the abstract. It is in music and philosophy that I found something more valuable than anything materialism could give. I have real happiness and not empty happiness that money and possessions promise. As far as the climbing the ladder it reminds me of Jacob’s ladder from the Bible. I have been on a spiritual quest for 11 years and feel comfortable about who and what I am, maybe this is why all the adults are angry with me, perhaps because I found something they haven’t? The “wrong side of the ladder” could be placing all energy and focus on material gains like the world wants you to and that could be why that guy fell off the ladder and I made it to the top. I “built my treasures in heaven” so to speak and intend to “come as a child.” I will not compromise my self in favour for what someone else’s expectations of me are. Therefore, the dream showed me I may be on the right track when it comes to morals and values and should not be surprised it people are angry with me because of it. I did take Quintin to the Greek Festival down the street. There was a bouncer slide and three of Quintin’s friends were there with their parents. I decided to run around and buy tickets for the “slide” for him and his friends. One of his friends was about to leave, so I stopped them and invited him on the slide. It seemed to cheer him up and I guess I was talking to him more than the parents so I did feel like one of the kids. I was also excited. This may not count as a day residue but I will explain that in the discussion. There was no condensation but, there was a bit of displacement because when the guy fell off from being on the wrong side of the ladder I looked and wondered if he was ok. The place from where he fell was so high that I knew he probably did not make it. My emotion was reduced when the secondary revision kicked in and assured me that it was not my fault and that I am not responsible for the actions of others. There was visual representation because I believe the ladder could have represented something more abstract; perhaps the concept implied by the Bible story mentioned earlier. There were no childhood memories that came out in this dream, unless you count all the carnivals that I have been to, but none of the events were similar to past events. Perhaps there was a wish fulfillment because I wish I could be myself without everyone being angry with me. There was one similarity in the methods of Free Association and Amplification. Both methods caused me to break the dream down into parts. They were also similar in the respect that they revealed coherent messages relevant in my life and both helped put perspective on my situation. Freud’s method showed to me that I should have more balance of love and work. So, I am making an effort to have more work to balance the love and pleasure side. Amplification showed me that others may be angry with me for choosing a path that not many follow. It was encouraging because not only did I get to play like a child, I made it to the top of the ladder suggesting that I may achieve my goal. Also, my issue in life may not easily solvable and there may be a price to pay. Some people may not make it to the top or see things from my level which actually lifted a load off my chest. The moral was that even though I disappoint some people, I may find something greater. Therefore, both Free Association and Amplification were useful. The methods of Free Association and Amplification were different to the extent that in Free Association I could not interpret the dream directly and in Amplification I could. I felt more comfortable with the Amplification method. It felt more natural and brought out a rant that I was holding inside for a long time. I actually felt better after interpreting the dream using Amplification. The Free Association method seemed forced and unnatural, and once it revealed that it was just about the camping trip I had the weekend before, all the magic was gone and I was left feeling disappointed. It was therefore not as powerful a method as Amplification because I got a rush using Jung’s method and did not get that with Freud’s. The question whether the meanings were found in the dreams or created by the methods used is rather interesting. It seemed as though it were both. Freud’s method revealed a meaning that was not in the dream and Jung’s method brought out meaning directly from the dream. Therefore, the methods may have been responsible for the meaning because Freud’s method forces you to look outside the dream and Jung’s method directs you inside the dream for meaning and consequently that is where the meaning was found. This finding could suggest that dream interpretation is arbitrary and whatever method you believe will work, will work. Then again, in order to properly evaluate Freud and Jung’s methods of interpretation, both methods had to be applied to each dream. In other words, Free Association was also conducted on the carnival dream and Amplification on the camping dream. 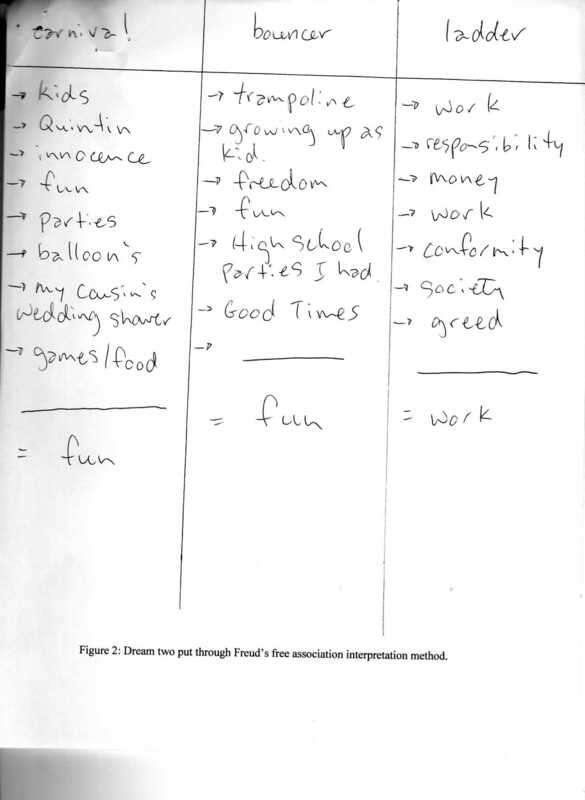 Freud’s method for the carnival dream revealed love and work as it did for the camping dream (see Figure 2). Jung’s method applied to the camping dream came out to a moving away from societal demands or getting back to nature. It also revealed that I would be protected in this quest. There was a slight difference in interpretation because other people were there with me having fun, implying that others could be brought along a similar spiritual quest. Meaning may be within the dream more so than created by the method, but only when Amplification was applied. Free Association seemed to create the meaning from the method by producing the same meaning for two different dreams. So, the meaning was created by the Free Association method. Amplification showed that the dreams were constructed to lay out different meanings, implying that the meaning is within the dream. In regards to this finding, Free Association could not be responsible for dream formation because the conclusions were the same for both dreams. If Free Association was responsible for the dream content or dream formation, then according to this theory I would have dreamed the exact same dream twice. Conclusions of evaluation between Freud and Jung tend to lean in favour of Jung’s method of Amplification. One reason is because when Freud’s method was applied to the dreams the same message was revealed for both, even though they were different dreams. This finding could imply that Freud’s method may be leading in the sense that the method brings you to where he wants it to go and not necessarily where the dream wants to bring you. Jung’s method brought out slightly different meanings for the dreams revealing that Jung’s method was more versatile than Free Association and could potentially reveal more in-depth or detailed information. Another reason Jung’s method may be better is because Freud’s method could potentially miss the point entirely. The Free Association tended to go far away from the original content of the dream. I felt that the part about the animals was not interpreted properly using Freud’s method. Amplification revealed more variety of information and got different results for each dream. This tells me that the method may be a more sensitive measure and could be used for finer detailed analysis. Thus, Amplification could be more representative of the meaning behind to dream because Freud’s method seemed to lead you to the same conclusion. A third reason why Amplification was decided to be a superior method for dream interpretation was Freud’s method for the carnival dream did not work because it was a projection of the future. The dream occurred on December 8th and we did not attend the Greek Festival until the 10th of December. Jung’s theory incorporates the idea that there could be a type of dream that projects future events. This type of dream is referred to as a prophetic dream. Other types of dreams include archetypal, lucid, somatic and personal mnemic. All of which could be interpreted through Amplification. Thus, Amplification can be applied to a wider variety of dreams than Free Association. However, Free Association may be best applied to personal mnemic dreams and was useful in the discovery of day residues. It may also be useful for somatic dreams, but further research is necessary for this conclusion. Amplification however, was found to be a more valid and sensitive measure due to the variety of information and detail that was revealed from one dream to the next. Amplification may be best for archetypal and prophetic dreams because it could more readily interpret the imagistic, presentational or symbolic nature of dreams. Although Free Association was best for personal mnemic dreams and detecting day residues, Amplification was found to be a more valid, versatile, representative and a more sensitive measure. Due to these findings, Amplification seems to have greater overall utility. Limitations of this study include the use of only two types of dreams (personal mnemic and prophetic). Future research in the utility of Free Association and Amplification as dream interpretation methods may want to include all types of dreams mentioned above (Archetypal, prophetic, lucid, somatic and personal mnemic). Also, the dreams selected could have produced confounds because the two dreams occurred in the same night, right after one another. According to Freud, this would count as a continuation. Thus coming to the same conclusion for both dreams may have been apt. Another suggestion for future research is when asked to report on Jung’s method, Freud’s day residues and mechanis1ms were reported again. Freud’s theory or mechanisms are not necessarily relevant to Jungian methodology. Therefore, the evaluation of the two methods was harder due to the overlap in report of day residues etc. Perhaps instead of asking about day residues and Freud’s mechanisms in regards to the Amplification method, examples of archetypes found in the dream, projections of the future or compensation could be reported instead. 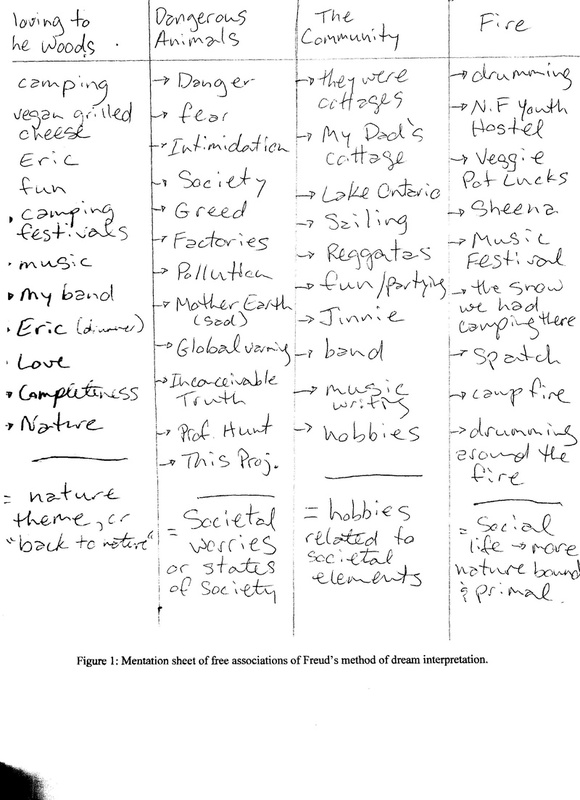 Figure 1: Dream one: Mentation sheet of free associations of Freud's method of dream interpretation. Figure 2: Dream two: Put through Freud’s free association interpretation method. In order to understand Altered States of Consciousness (ASC), a normal or “reference state” must be first defined. The state that we are subjectively in most of the time will be referred to as the reference state. A reference state could be described as having two dimensions (1) operant, which is being in control or manipulating on the environment and/or being goal-oriented and (2) stimulus bound, which refers to paying attention to something external such as sensations of sight, touch, sound etc. (Lect. Oct. 17, 2006). For example, while writing a paper on ASC, one would be operant because they would be directed towards a task with a goal in mind and also be stimulus bound because they would be paying attention to research materials and the computer by reading and typing on the keyboard. Let’s say a student is in an operant, stimulus bound state more often then not, thus being their most frequent state. An operant, stimulus bound state will therefore be the operational definition of a reference state for the purpose of this paper. With this definition in mind, an ASC would thus be any state that is different than the reference state described by these two dimensions. The opposite of operant is respondent and the opposite state of stimulus bound is stimulus independent. Using a 2x2 matrix of stimulus bound/stimulus independent and operant/respondent, three examples of ASC and the reference state can be better understood by showing how each state falls under different dimensions (see Figure 1). A respondent state is not directly operating on the environment, but absorbing it. For example when listening instead of talking one is in a respondent state. In this example the person would still be stimulus bound because they would be paying attention to external stimuli such as speech sounds and conversation. Stimulus independent refers to thoughts and actions that are not about the setting or task (Fch. 8). For example, day dreaming about what happened yesterday while driving a car is a state that is stimulus independent but different from operant because attention is not directly on the task at hand (Lect. Oct.17, 2006). This is being respondent. Being respondent but stimulus independent represents the sleep or dream state when external stimuli are greatly reduced, and the attention is internal. It could be quite easy to alter your state of consciousness. One could simply shift focus from external stimuli to internal stimuli, or become receptive rather than active. An ASC can also be achieved simply by increasing or decreasing the state of arousal. Hebb (Lect.Oct.31) stressed the importance of arousal and how humans almost have a drive to maintain certain level of arousal. For example, by meditating, or cutting off external stimuli, it can lower arousal and help a person become desensitized to fear, but too much desensitization could influence risk taking behaviour and cause injury or death. Raising arousal can help if you are too sleepy and have to write an exam, it would be good to raise arousal for performance on the test. But, too much arousal can decrease the ability to concentrate on the exam. In the reference state described for this paper, arousal would be in the medium range. By merely raising or lowering arousal, the reference state can be changed and an ASC can be reached. A possible function of ASC could therefore be to learn to shift our state of arousal to be in the most appropriate state for the situation we are in or the task we are performing. The mind-body problem refers to the relationship between the mind and the body. The problem is that it remains undetermined if mind and body are two separate entities, or merely one in the same. Philosophers, neurobiologists and psychologists all seek to discover where consciousness fits in with the mind and body (Farthing, 1992). Three major obstacles in testing a hypothesis related to this problem are (1) coming up with an agreed upon operational definition for consciousness (2) where is consciousness’ place in science (is it relevant to study it at all?) and (3) does consciousness or thought directly control behaviour providing evidence for free will (Fch4)? The two major competing theories of the mind-body come from the dualist and the materialist monist perspectives. Dualism suggests that the mind is different or separate from the brain and the body and is made of non-physical substance. The people who support this stance are usually those who have spirituality or faith in religion and believe in a life after death. Out of body experiences (OBE’s) and near death experiences (NDE’s) seem to provide evidence for dualism. There are some physical explanations of OBE’s and NDE’s that attempt to boil these experiences down to a sensory deprivation type effect or hallucinations from lack of oxygen to the brain (Fch.4). Even if OBE’s and NDE’s could be explained by physical theories, it may be the case that hallucinations merely aid in the experience and then only in some of the cases. They certainly cannot account for all aspects of these types of experiences (Farthing, 1992). An experiment conducted by Libet in 1985 (as cited by Blackmore, ch. 9) can be interpreted in a way that suggests mind and body are separate. In his experiment readiness potential (a negative shift in electrical potential that occurs before a voluntary action) is measured in relation to a conscious wish and a voluntary action. The results showed that the conscious wish occurred before the action suggesting that consciousness could override the action just before it was produced. Therefore conscious will could give the action the go ahead, or it could suppress it implying there is an interaction between two substances. Material monism is the belief that the mind or consciousness is a direct result of physical matter or the brain. There is no other type of substance other than physical matter and there is no life after death because according to this view, when the brain dies, the mind dies with it. Different types of materialist monism include epiphenomenalism, identity theory (reductive materialism), emergent interactionism, and functionalism. Epiphenomenalism states that consciousness exists, but only as a bi-product of brain activity. Epiphenomenalists also believe that consciousness has no direct influence or control over behaviour. The same experiment by Libet mentioned above could also be interpreted as evidence for epiphenomenalism. For example, if the response potential came first, it could show that consciousness has no role in controlling the actions of the body. However, the action can be allowed to pass or could be suppressed at the last -200 msec with conscious will (Blackmore,ch9). This brings us to the question of free will. Many have argued that we do not have free will based on the evidence that the response potential arises before conscious recognition. Libet argued that our conception of free will may be different than what it really is. We may not have free will, but we may have a “free won’t” if we can control the outcome of the response potential (Blackmore, ch.9). Identity theory (reductive materialism) believes that for any mental state there is corresponding brain activity. Reductionism implies that all thought processes can be explained through neurophysiology. The mind and the brain are inseparable because mental states are physiological states (F ch.4). If this were the case however, then everyone would have exactly the same subjective experience or perception of the world because we all have the same physiological parts (author’s interpretation). Emergent interactionism kind of mediates between dualism and monism because it believes that the relationship between the mind and the body cannot be summated from the parts alone (unlike identity theory). According to this view, the emergent phenomenon of consciousness is produced by the unique relationship between the parts in the brain creating a highly organized system. Consciousness therefore transcends the details of neurology by a quantification of the various layers of activity and emerges out as a unique experience that we call consciousness (Fch.4). This view seems plausible because it has been said that the role of consciousness is to integrate the moment to moment experience (Hunt, Psyc 3F07 Lect, 2006). Functionalism maintains that mental states are meaningful in a particular context that defines their purpose or evolutionary function. The function is what is important in the context of a cause and effect relationship, not the type of physical substance or location in the brain that produces it. For example, the mental state of fear is useful in the sense that it allows the organism to react and stay safe in their environment. Functionalism gives rise to the idea that computers and robots can be constructed using the functionalist model of consciousness. This view does not take into consideration subjective experience and evidence shows that the computational model cannot help us explain or understand mental processes (Farthing, 1992). Overall, there may be more evidence for dualism because when in an ASC such as mindful meditation we seem to be a hidden observer. This implies again that there may be an interaction between two substances. The evidence however, is mostly theory and introspective verbal report or based on phenomena like OBE’s that has highly speculative reality status. Therefore, further research may be needed to solve the mind-body problem. There are many potential ASC that are different from the one that we refer to as our reference state. Studying altered states of consciousness is important for understanding ourselves and our reference state of consciousness. A working definition of ASC is a “temporary change in the overall pattern of subjective experience” (Farthing, 1992). ASC that have been researched include daydreaming, sensory deprivation, dreaming, REM deprivation, hypnosis, meditation and psychoactive drug states. Altered states can affect health, knowledge and social relations. Each altered state could be useful or harmful depending on the situation and therefore have advantages and problems. An operational definition of daydreams is that they are considered to be any thought during the day that is not about the situation or task at hand. In regard to health, guided daydreams have been used by cognitive therapists to aid in the “modification of goals, attitudes, self-concept, anxiety and behaviour” (Farthing, 1992). This could be an advantage of daydreaming but a problem could be that daydreams about worries can produce stress, which has an adverse effect on health. Wish fulfillment as conveyed through daydreams can be helpful because they express our emotional needs. Daydreams can also help break up the monotony of the day and can reveal fears and desires (Farthing, 1992). Studying the content of your daydreams can also reveal one’s temperament (Farthing, 1992). Knowing or understanding your temperament, fears and desires can help breakdown them down and/or help one go after their desires. Thus, daydreams help reveal aspects of the self and can assist in greater self knowledge. Whereas these provide a function of greater knowledge about the self, there is an appropriate time and place to daydream. Daydreaming at work would not be appropriate. For example, Antrobus (Farthing, 1992) conducted a study that tested daydreaming and vigilance. It was found that as task difficulty increases, daydreams were less, but performance was still only 50% correct, even on the most difficult task. This suggests that daydreaming has an effect on social life and job performance. Daydreaming affects social function because if one is engaged in a boring conversation, that person not to be listening as much as you expect. Daydreaming closes one up and narrows their perspective. This could be a disadvantage in the workplace. Positive-vivid daydreams and can have social function because they aid in goal-achievement by refreshing our memory about what our goals are, providing an opportunity to re-evaluate goals and make changes if necessary (Farthing, 1992). They can also help us sort through problems or negative situations that occur in social life. Sensory deprivation is when the reference state is altered due to severe lack of external stimulus. It would fall into the stimulus independent/respondent box in Figure 1 because there is no external stimulus to operate on and attention is forced inward. Research evidence shows that arousal drops during sensory deprivation and low cortical arousal and high somatic arousal occurs (Lect. Oct.31, 2006). Sensory deprivation or restricted environmental stimulus technique (REST) in a floatation tank pioneered by John Lilly (Fch8) can aid in relaxation and is used therapeutically for stress reduction and therefore provide a health function. As for knowledge, research evidence shows that sensory deprivation can produce hallucinations and reduce cognitive efficiency (Farthing, 1992). Cognition becomes reorganized, therefore knowledge is affected (Lect Oct.31). This could be a disadvantage to the sensory deprivation state because it would not be wise to take an exam while experiencing the after effects of sensory deprivation. So, again there is an appropriate time and place for experimenting with this altered state. Some people have mystical experiences or revelations about themselves and the world during sensory deprivation. That can aid in self knowledge and knowledge about the world. Thus it can help in the re-evaluation of goals, values, philosophy and religiosity. Research evidence shows that dreams may have health benefits because dreams help preserve sleep (F.ch12 & Lect.Nov.7) and sleep has a restorative function (Farthing, 1992). Freud used dream interpretation to reveal hidden desires and wishes in his neurotic patients. He believed this works because dreaming about wishes reduces the chances that unconscious desire will produce neurotic symptoms (Farthing, 1992). Jung’s research implies that dreams serve as a compensatory function to maintain balance in psychic systems (F.ch12). Adler also believed that dreams could act as a personal problem solving function (Fch.12) and could therefore assist in greater knowledge about the self and provide social function. Lucid dreaming can be used to gain greater knowledge about the self (Farthing, 1992) but, lucid dreaming has been neglected in research because it goes against most theories of dreaming and is also considered rare among dreamers. According to these researchers dreams provide function, but Foulkes and Hobson believe that dreams serve no function and are just a bi product of random firing of neurons in the brain (Lect Nov.7, 2006). As far as advantages and problems with dreaming, all the health, knowledge and social functions dreams can provide, advantages but nightmares can be problematic. Starker (1974; 1978 as cited by Farthing, 1992) found a correlation between content of daydreams and night dreams by administering the IPI questionnaire for daydreams and dream diaries for night dream content. Nightmares were found more in the anxious-distractible type daydreamers. So, dream behaviour at night can carry over into the day where there can be inappropriate and create stress. Problems can also come from depriving people of dreams. Hobson believes dreams have no function because they are a by-product of random neuron firing in the brain (Farthing, 1992). He also believes that dreams occur in the REM state, so if a person is REM deprived, all of the benefits in regard to health, knowledge and social functions are lost, especially problem solving (Lect. Nov7). There have been dreams reported outside of REM however, but lucid dreams are particularly elicited from REM (Tyson, Ogilvy & Hunt). Dement conducted an experiment in REM deprivation by waking people up every 90 minutes (Lect. Nov.7). He found that the longer people were deprived of REM, the more often the body tried to attempt REM. On recovery nights, the REM deprived person spends a lot of time dreaming as to make up for the lack. This suggests there must be a function for REM, providing an argument against Hobson. In regard to health, one study showed that the more REM deprived one gets, the more irritable, and emotional the person becomes. Decreases in concentration and cognitive dissonance were found, affecting knowledge function (Lect.Nov7). Also, maladaptive symptoms such as becoming more easily angered were found showing a possible effect on social relationships (Lect.Nov7). Dreams therefore help organize and integrate the self providing at the same time a health, knowledge and social function. Freud believes that if dreams cannot be recalled, it may be a sign of repression which can have detrimental effects on health, mental health and social relationships thus providing advantages and problems (Farthing, 1992). Hypnosis is a change in perception, thinking, memory and behaviour produced by a ritualistic procedure (Farthing, 1992). Weitzenhoffer and Hillgard developed a hypnotisability scale that shows people can be very open to suggestion during hypnosis by performing ideomotor, response inhibition and cognitive suggestions to name a few (Farthing, 1992). Hypnosis can provide health benefits because people have used hypnotherapy to help quit smoking and control weight. Hypnotherapy however, has been shown to be more effective for non-voluntary disorders such as reduction of pain, or asthma but even when it works it is no more effective than non-hypnotherapeutic methods (Farthing, 1992). Knowledge about consciousness has increased due to research in hypnosis. Hilgard’s neodissociation theory is consistent with modern idea that cognitive systems are coordinated by an executive control system (Farthing, 1992). Social-cognitive theory suggestion that functioning of the cognitive and behavioural control is not so much changed as the subjective interpretation of the control processes (Farthing, 1992). Regardless of which theory is more correct, it contributes to greater knowledge about consciousness. Affects on social function is similar to sensory deprivation in the sense that those who are hypnotized are very open to suggestion. When one opens themselves up they become less biased, it allows for maximum communication and maximizes the potential to respond (General Systems Theory). This can be advantageous in certain situations such as listening and in social relationships. Being too open can cause problems too such as becoming overwhelmed by information potentially causing shut down or seizures (Lect.Oct.24). Being too open or unbiased can be problematic to survival needs because risk taking behaviour may increase without regard to safety. Being too open can also impede learning, memory development or evolution because if everything is equal, then nothing can be narrowly focused on or specialized (Lect.Oct.24). This is how some states can have their advantages under certain situations and be problematic in others. Subjective health benefits of meditation have been reported in regards to inner peace, greater sense of well being, increased mental efficiency, reduction of anxiety, stress and stress related disease, improves sleep and helps to control drug and alcohol abuse and has been used as a technique for reducing physiological stress reactions. Some experiments have shown that these effects may be produced by a placebo effect. Smith (1976 as cited by Farthing, 1992) ran an experiment with a Transcendental meditation (TM) group, a no treatment control group and a placebo group. The placebo group was told to do some bogus anxiety reduction method and their anxiety level was no difference than the TM group implying it is the expectation that lowered anxiety. Delmonte (1987 – Farthing, 1992), however reviewed a number or meditation studies and found evidence that meditation not only reduced stress, but also decreased depression, increased psychological well being and self actualization, therefore providing a health function. Meditation can affect knowledge in the sense that attention may be better controlled with increased meditation. Kubose (1976-Farthing, 1992) found that the number of intrusions in attention was reduced as training in meditation continued. It has also been found that those who practise concentrative meditation showed more sensory withdrawal which can also contribute to better attention (Blackmore, ch.26). People tend to meditate to gain self knowledge and to acquire paranormal experiences and healing techniques, but these aspects have not been fully researched (Farthing, 1992). Social functions of meditation include the idea that people who meditate may be able to control their reactions to stress. This has a social function because it can improve interpersonal relationships. Mediation creates a shift to a more open state and therefore has the advantages and disadvantages that go along with being open as mentioned above. In regard to health, psychedelic drugs show more side effects than health benefits. There are physiological effects such as increased heart rate in marijuana. Jones (1971 – found the heart rate was higher for infrequent users than for frequent users implying that there is a tolerance effect (Farthing, 1992). Marijuana can also cause reddening of the eyes, however because marijuana reduces blood pressure in the eyes, it has been used medicinally for glaucoma. Marijuana suppresses REM sleep and can therefore throw off sleep patterns. Greater knowledge of reality and neurobiology has been gained from research in hallucinogenic drugs. For example, hallucinations of faces were found to activate the part in the brain associated with faces, hallucinations of colour, in the colour region and hallucinations of objects in the object area (Blackmore,ch21). Perky (Blackmore, ch21) did an experiment where participants watched a blank screen and were asked to imagine a tomato. Meanwhile, the image of a tomato was gradually brought up onto the screen. The participants maintained the belief that they were imagining it. These findings suggest that the line we draw between reality and imagination is not as distinct as we previously thought. Thus greater knowledge of the mind and reality can come from research in drugs and behaviour. Greater knowledge of the self can potentially come from hallucinogens such as “magic mushrooms” or LSD because people may have revelations or mystical experiences under the influence (Farthing, 1992). Drugs can provide social function because some drugs may open people up making them more comfortable in public. For example, alcohol increases confidence and marijuana has produced more laughter and comfort in a social context in some individuals. However, although marijuana is said to improve interpersonal relationships, evidence shows the contrary. Weil and Zinberg (Fch.18) found that marijuana disrupts the smooth coherent flow of conversation therefore drugs can also close a person down as opposed to opening them up. Advantages to being more closed is to prevent one from becoming too overwhelmed by stimuli, it also aids in survival and increases speed and efficiency on tasks. Disadvantages to being too closed would be to narrow the range of input too much so that balance in our bodily, psychic or emotional systems gets thrown off. Being too closed can cause a person to be too introspective and neglect the outside world, it can also cause responses to be too predictable and automatic (Lect.Oct.24). This could allow for one to be easily stalked, bringing us to social functions. When one is “stoned” from marijuana, it produces a shift from verbal processing to more holistic, imagistic thought processing. This can allow one to see things from different points of view, perhaps increasing empathy towards others and providing social function. Overall, it is best to weigh the state, whether it is the reference state or an ASC against the situation plus the advantages and disadvantages to being open and closed. This would provide for the best balance of body-mind and for optimal functioning. The reference state is your “self” in an organized state. ASC are therefore merely the reorganization of the self to meet the standards of any given situation. The ability to shift and adapt to different circumstances is an asset and a very essential skill to learn, making the study of consciousness very important to psychology. I did notice that you used the "in the expected direction" phrase that I suggested you remove years ago :-) :-) :-) However, you did not include the table of hits versus misses that would accompany this stat. so. I looked it up and assuming I got the correct data set. You had 58 trials and 16 hits (correct answers) where chance would have predicted 14.5. i.e. you expected 14 or 15 (out of 58) and got 16 (in both music and no music condictions combined). If we look at JUST the music condition, which shoud improve ESP as I understand it, then you expected 6.5 (out of 26) but got 8 hits, which is still not significant. So I looked at how many people you would need for this size of effect to be significant and you would have needed over 200 people to show an effect in the music condition. i.e. IF ESP exists it is very, very weak. then we can go get a drink. ...sure!!! I'd like that and haha ooooops i did keep that in about in the expected direction. I knew there was something going on in there that was somewhat promising,but I guess I didn't see it. are you saying that if I combined the two conditions my result was above chance??? I thought I did that and found non-significant levels. And, yes, it was just not feasible to run 200 participants because I could only run 2 at a time. I would have needed another year lol! The metaanalysis seeks any results - significant or non and could very easily get this published - at risk of career suicide of course ;) Also, if ESP and similar occurrences were experienced at a level above chance, they would not be rare and people would not experience the mystical or noetic quality the experience can bring. This experience is important to people and makes them feel special. If it happened to everyone, all the time, it wouldn't be important or have a aha! oh wow feeling. They are supposed to be rare otherwise they would not be significant (in this case in the lives of people and their experience). So, the stats are not supposed to be significant, to allow the experience to remain significant - does that make sense?? But I will say that you are (we are) using the wrong tools to measure the phenomenon. Perhaps a more Phenomenological approach may work. (still empirical) all case studies could be brought together and different features could be Content Analyzed. You would find similar experiences as Mystical experience, OBE's Near death experience, Lucid dreams.....all being ineffable, noetic (things are learned), transient and sometimes passive etc. Most researchers who study ESP and Psi related phenomena, alongside their definition, mention that there is no known mechanism that creates said effect (Bem, XXXX). But, what if there is a mechanism or explanation behind how Psi experiences such as Telepathy, Telekinesis, Synchronicity, Premonition and Empathic communication can occur?! The answer may lie in the research studying the evolution of consciousness. Washburn (XXXX), studied amoeba and found an anomalous series of behaviour in the interaction of two particular amoeba. Studies of emergence in consciousness have postulated that if amoeba and paramicium can display emergent spikes in learned and adaptive behaviour, then it is not a huge stretch to imagine a neuron can be just as conscious. A neuron is a single-celled organism, but when joined in a collective, like inside our brains, they create a hive-mind mentality. This is what I postulate because this is not exactly agreed upon in the area of study. In my theory and in my opinion this is a reasonable explanation for what generates the field of consciousness in the human mind (or in the minds of other animals). Consciousness has many degrees of awareness, humans having the most self awareness which includes metacognition. When neurons in one person meet up with the neural net of another, if there is an open circuit created between them, then the neurons of one person could communicate with the neural net or field of the other. To explain telepathy etc. in persons who are miles apart, emotional capacities act as a catalyst to boost the signal. When the body, mind and emotional capacities are in properly in line and in a certain balance, then energy can overcome the boundaries of space and time. nothing is faster than the speed of consciousness because it messes with time. We do not experience gaps in our perception because the feedback loop fills it in by jumping backwards in time to fill in the gaps. Susan Blackmore has the details of this in her work. So, when all levels of human experience are balanced and in line, time and space can be overcome.